Mode of occurrence: Small regular nodules. Cortex: Worn, thin, light brown, smooth, transition sharp. Appearance: Reasonably homogeneous material with a dull lustre, opaque, smooth, very medium-grained. 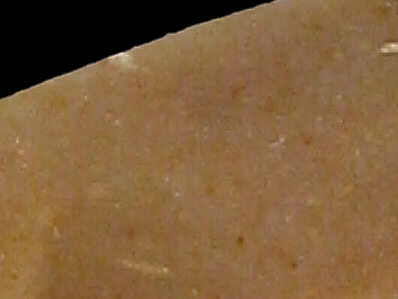 Texture: Wackestone, with a packstone band below the cortex. Grains: 15-20 to 35 %, yellow to orangey yellow, rounded with high sphericity or irregularly shaped (mean size 150 µ). Grain composition: Sponge spicules, bryozoan fragments, planispiral foraminifera, several acritarchs (80 µ); rare iron oxides and detrital quartz.